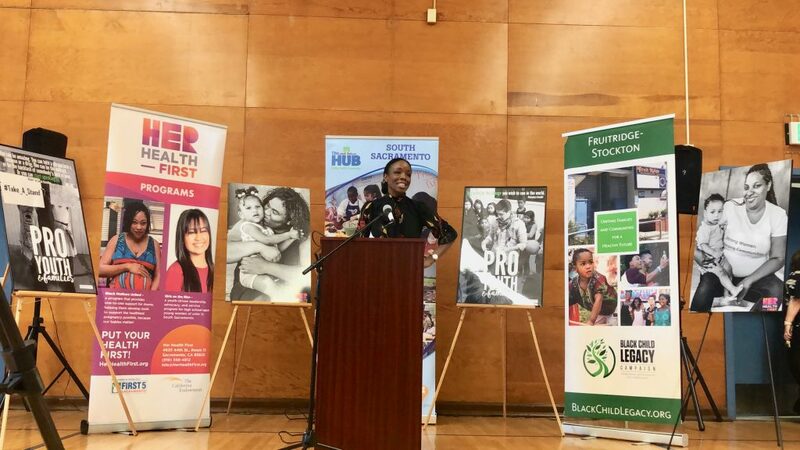 Sacramento, Calif. — California Surgeon General Dr. Nadine Burke Harris launched today a statewide listening tour at Fruit Ridge Community Collaborative (FRCC) in Sacramento to raise awareness about the link between Adverse Childhood Experiences, toxic stress and serious health conditions. Dr. Burke Harris will travel the state to listen to the unique challenges that communities in each region face when addressing the root causes of serious health conditions and health disparities. Bringing together community members, healthcare providers, and leaders to roundtables across the state, Dr. Burke Harris will hear how the Office of the Surgeon General can support communities with prevention and treatment. The Surgeon General’s listening tour will include stops in Alameda County, Butte County, Fresno County, Kern County, Los Angeles County, Orange County, and San Diego County. In Sacramento, joined by First 5 Sacramento leadership, Dr. Burke Harris visited FRCC’s campus and brought together educators, service providers, and community members to discuss the community’s healthcare priorities and challenges. Dr. Burke Harris visited organizations in the FRCC including Pivot, PRO Youth and Families, Black Mothers United and the River Oaks Family Resource Center to learn about their work to provide access to healthcare services and resources for their communities. Dr. Burke Harris also discussed the work that the State is doing to ensure better health outcomes with Governor Newsom’s early childhood budget proposals that are focused on developmental screenings, support for home-visiting initiatives and improving infant and maternal health. These programs total over $200 million in the Governor’s 2019-2020 budget proposal. Gov. Gavin Newsom appointed Dr. Burke Harris as California’s first Surgeon General on January 21, 2019.